COVERAGE FOR GASOLINE VEHICLES: 20,000 KM (or 1 year) Service Intervals. Maintenance performed outside scheduled maintenance intervals or by an entity/individual that is not an authorized Mercedes-Benz dealer in Canada. Damage of any type caused by, but not limited to: accidents, fire, alterations, improper/poor fuel, algae, rodents, misuse or neglect. YOUR SERVICE ADVISOR MAY MAKE ADDITIONAL RECOMMENDATIONS BASED ON FACTORS SUCH AS THE LOCAL ENVIRONMENT, ROAD CONDITIONS OR INDIVIDUAL DRIVING HABITS. As of May 2015, Prepaid Maintenance is available for 2013 and newer models, and is not currently available on G 550, SLS models. When Prepaid Maintenance is purchased as part of the lease contract, with matching terms; applies only to vehicles that are returned at end of lease term. On every Service for B-Class. COVERAGE FOR DIESEL VEHICLES: 15,000 KM (or 1 Year) Service Intervals. COVERAGE FOR AMG & V12 MODELS: 15,000 KM (or 1 year) Service Intervals. As of May 2015, Prepaid Maintenance is available for 2013 and newer models, and is not currently available on G550 or SLS models. ▲ Where applicable with limited slip differential (C63, SLK55, E63, CLS63, SL63). Q: Do I need to return to the same dealership where I purchased the plan to service my vehicle? A: Purchase of a Mercedes-Benz Prepaid Maintenance plan does not confine you to only one dealership for your service needs. The plan follows you, so if you require service when you’re on the road — or if you relocate — your plan will be honoured at any authorized Mercedes-Benz dealer in Canada. 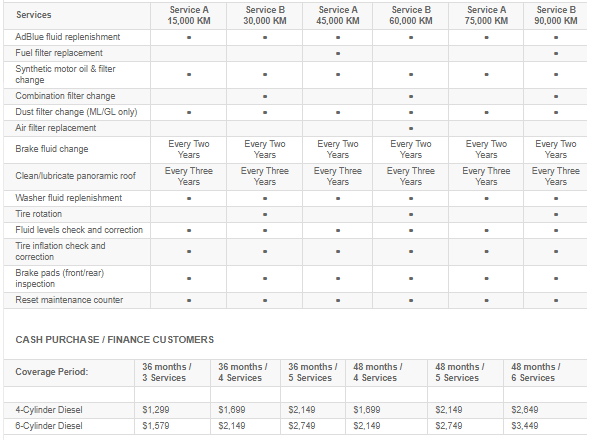 Q: Why do I need a maintenance plan for my Mercedes-Benz? A: The Mercedes-Benz Prepaid Maintenance plan is designed to maximize the service life of your vehicle’s components and systems for optimum performance. The plan provides you with value; up to 30% savings versus purchasing maintenance as you go and a convenient way to service your vehicle without the worry of having to pay later on — so you can avoid unwanted surprises. Keeping up with factory scheduled maintenance also helps keep your warranty valid. 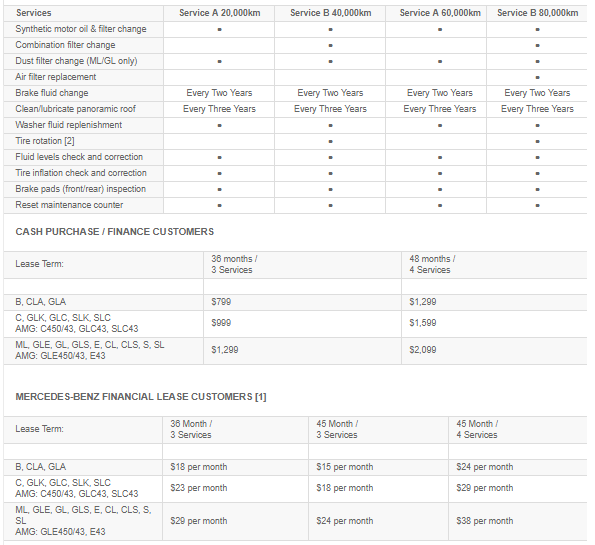 Q: Why would I choose to purchase a maintenance plan if I’m leasing my vehicle? A: Even when you are leasing your vehicle, you are responsible for all needed maintenance and repairs as described by the terms of the lease agreement. 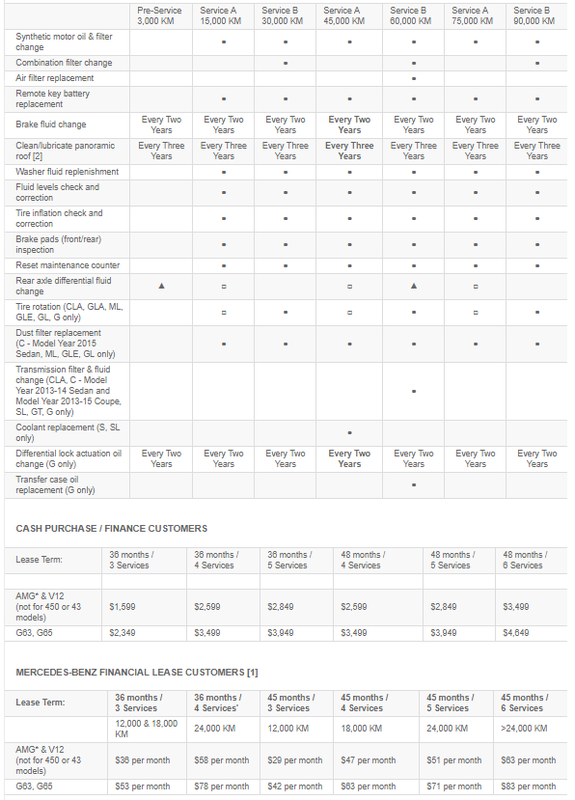 Lease customers who purchase a Mercedes-Benz Prepaid Maintenance plan may receive a increase in the residual value of their vehicle. This can result in an additional savings of 20%, when Prepaid Maintenance is purchased as part of the lease contract, with matching terms.